May 30th, 1796 at Borghetto, near Valeggio sul Mincio, 25 kilometers southwest of Verona [nowadays Province of Verona, Italy]. French army (27,000 to 28,000 men) under General Napoleon Bonaparte. Austrian army (6,000 to 18,000 men according to various sources) under General Johann von Beaulieu. French army: 500 men (killed or wounded). Austrian army: 600 men (killed, wounded or prisoners), 4 cannons. "The Battle of Borghetto" (detail). Engraving. 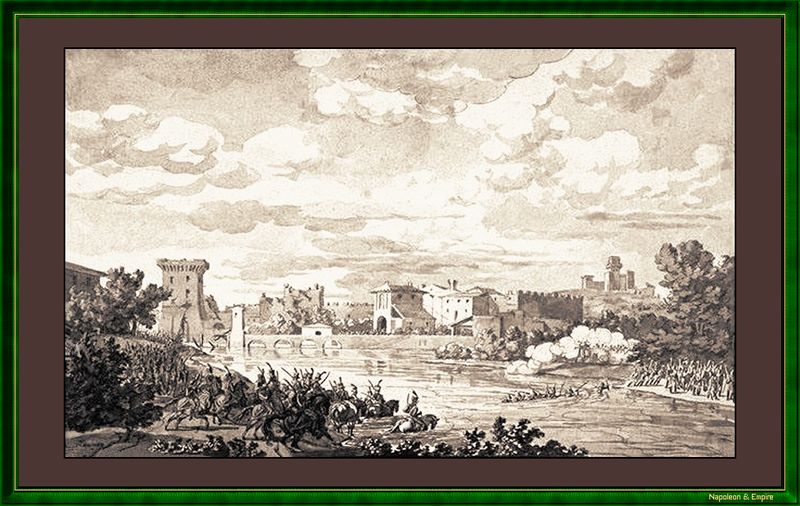 The battle took place at the location called Borghetto , on both banks of river Mincio, down below the castle of Valeggio . This website has been designed for a screen resolution of 1280 x 800 pixels. Last update: 2018-07-26 21:30:45.